St. Francis of Assisi lived from 1182-1226. He called animals “brother” and “sister,” and he famously preached to birds. The Catholic church tells a story about St. Francis taming a dangerous wolf, making a pact with it not to harm humans, who are made in the image of God. He sounds kind of nuts. If St. Francis stood in a park today and preached to the birds and rabbits, I suspect most of us would keep a wide distance. But those early believers must have seen something genuine in him, because he is now canonized as one of the most famous saints. The Feast of St. Francis is celebrated on Oct. 4. 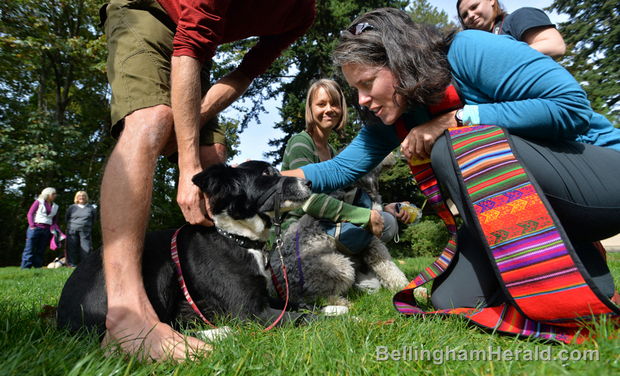 In Bellingham it’s accompanied by several Blessing of the Animals services, associated with various churches around town. Since our naughty dogs are always in need of a blessing, we showed up at the local park and found two dozen other dogs and their people in attendance, mostly strangers to one another, all gathered together for the love of our dogs. After a short 10 minute service—which included, of course, the Prayer of St. Francis, and a lovely poem called Blessing the Animals by Jan Richardson—the dogs and their people all lined up to receive a blessing from the pastor. It was a hodgepodge group that showed up for the Blessing of the Animals. There was a middle aged woman with her border collie; an old man with two Labradoodles that were mirror images of each other; a man and his chow chow, both of whom preferred to stay on the fringes; a whole family wearing Sunday best clothes, surrounding their Golden Retriever like a family bearing joyful witness to a baptism. There was a whole convention of blond poodle mixes. Is there a collective noun for a group of Labradoodles? An oodle of doodles, perhaps? The Blessing of the Animals was advertised in the church’s e-newsletter, and in some posters and flyers around town. Most people who came didn’t know what to expect, how many animals would be there, or even what denomination or type of church was hosting the event. But they came anyway. How different would this have been if the event was a public “blessing of the people?” What if, instead of an animal blessing, the poster advertised “Public Blessing at Cornwall Park! Come as you are and get blessed!” Without knowledge about the type of church, the length of the event (no one likes a long sermon), the creed and beliefs of the host church, would anyone come? Would anyone take time out of a beautiful Saturday to walk to a local park and receive a personal blessing from an unknown person of unknown faith? It seems unlikely, and definitely uncomfortable. And yet dozens of people eagerly stood in line for the pastor to lay her hands on their dog’s furry head. What would it be like, to be such an open vessel as a dog? To eagerly receive every blessing, never questioning self worth, making disclaimers, asking “why me”, or looking for strings attached? THANKS for the reflection, Gwen!